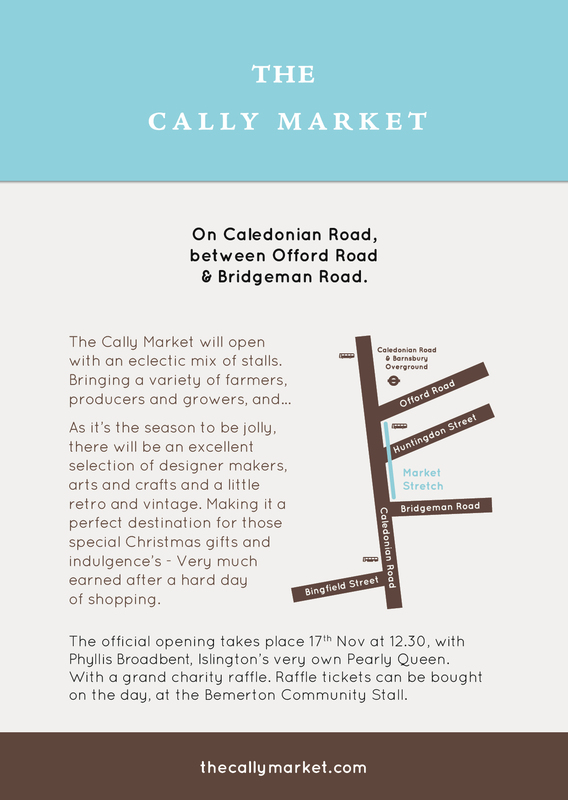 Saturday 17th November our brand new street market The Cally Market opens!!!! The good folk in and around Caledonian Road have joined forces to create a new and exciting shopping hub which is hoped to bring a wider choice of goods while complementing the already eclectic mix of established businesses. 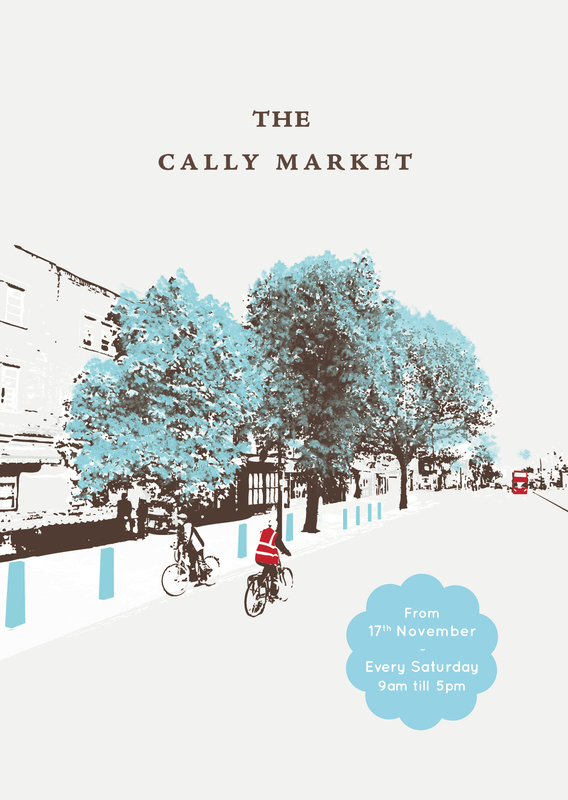 Along the Caledonian Road, on Saturday the 17th November 2012 you will find an exciting new street market, ‘The Cally Market’, situated on the wide pavement in front of the shops just left of Caledonian & Barnsbury station. The exciting little street market has come about by the local people pulling together to create a market that works alongside local shop-keepers: where the original chat began for a street market to try and encourage local people to stop and take a fresh look at the many independent business they have around them. News quickly spread to local residents who were hungry for locally produced and grown foods with a good sprinkle of arts and crafts, designer/maker and little bit of vintage too! Both residents groups and shop-keepers from all sides of the street have worked with Team Cally and Islington Council to gain the necessary support to make this happen. Louise Brewood of Broadway and Exmouth market fame was brought in as Market Operator for her ability to work with all areas of the community to insure the market meets their needs, while meeting the council’s guidelines, but more importantly getting the balance for local shopper’s right. Janine Dorling, local resident and chair of the local Traders group, has been moved by the depth of positive support and demand for a modern street market. She has been conducting surveys and polls to get local opinion and has been overwhelmed by the proactive response for a rich mix of stalls: which she says “We are all working to try and meet”. Initially the market will open with an eclectic mix of 20/25 stalls. As it’s the season to be jolly there will be an excellent selection of designer markets, arts and crafts and a little retro and vintage, making it a perfect destination for those special Christmas gifts and indulgence’s – very much earned after a hard days shopping. Louise Brewood ‘Channel Fish’ bring along a wide variety of fresh fish depending on what they have caught just of the Brighton coastline. ‘Artisan Bakers’ Klaus Kuhnke, this well established expert baker brings an excellent variety of baked breads and goods. ‘Perry Court Farm’ who currently grow 150 varieties of apples and pears alongside a huge range of seasonal vegetable and salad crops. ‘The Deli Cupboard’ with a wide range of chutneys, pickles, German sausages and much more. ‘Priors Hall Farm’ with an excellent range of farm reared meats of fully traceable feed supply, with traditional recipes and methods use on site for curing, smoking and preparing hand-made products. The official opening will take place on the market, Saturday the 17th November 2012 at 12.30, with a welcome speech from Cllr Paul Convery –whose support has made this dream a reality. Phyllis Broadbent – Islington’s very own Pearly Queen, will be performing the ribbon cutting followed by a good old fashion knees-up and Market Hamper charity raffle, which can be bought at The Bemerton Community Stall. The 1st of December sees the switching on of the Cally Christmas lights with lots of local Carol Singers, hot spiced apple, mince pies and mulled wine. This entry was posted in Food and Drink, Local businesses, Noticeboard and tagged Artisan bakers, Caledonian Road, Caledonian Ward, cally road, Channel fish, Community, Islington, Pearly Queen, Perry Court Farm, Phillis Best, Priors Hall Farm, Street market, The Cally Market, The deli Cupboard. Bookmark the permalink.